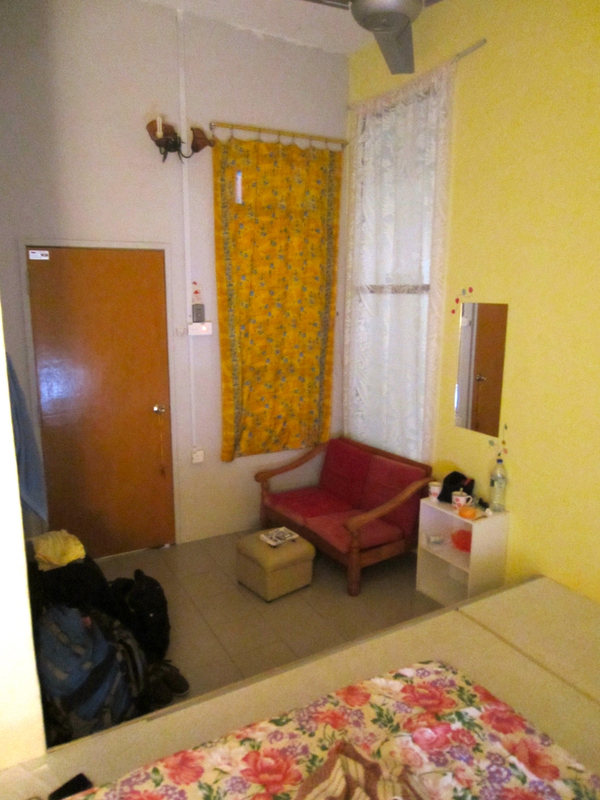 Home » Asia » Malaysia on the Cheap » Boom Shaka Melaka, Malaysia! We took a bus from Kuala Lumpur‘s Terminal Bersepadu Selatan which was easily reached via Bandar Tasik Selatan LRT Station (yellow line). Buses to Melaka run very often, cost RM9/$2.90 per person, and are very comfortable. From the Melaka bus station we shared a taxi (RM20/$6.40 in total) with another tourist who was going to the same guesthouse as us. The buses to the Bukit Cina area were not very frequent. Our private double room at Old Town Guesthouse. We stayed for 3 nights at Old Town Guesthouse (RM45/$14.45 per night for a private double AC room with shared bathroom including breakfast). The guesthouse is run by a very friendly French-Malaysian couple who have two cute children. You live in their house: a clean, homey, and relaxed atmosphere. It is in the Bukit Cina area which is not in the historic district, but it is very close and there are a lot of tasty Chinese restaurants nearby. It is also conveniently located next to Little India. Our room was quite large and even had a sitting area where you could sit and eat or read. The breakfast in the morning was excellent: toast with marmalade, jam, peanut butter, and fresh fruit. 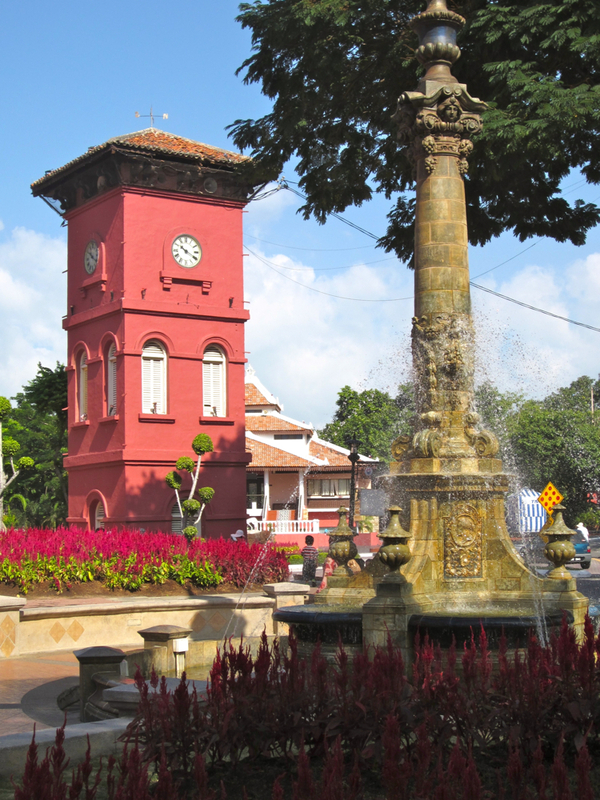 We decided to spread our walking tour of Melaka across two days. It was very hot and the first section of our tour involved climbing up the Bukit Cina hill to see the Chinese cemetery (the largest outside of China) and then across the river to Kampung Morten, a village of traditional Malay houses. We then headed into the World Heritage City zone where we wandered the narrow streets as well as the famous Jonker Walk filled with antique and souvenir shops, and art galleries. At this point we ended our tour at the Melaka River where an eager middle-aged Chinese waitress convinced us we needed an ice-cold beer… or five… served in a bucket of ice. We sat and relaxed trying to ignore the ever persistent wafts of sewage in the air. The historic district is a compact area of traditional buildings. Depending on how stinky it is that day, you should go for a drink by the Melaka River. The old town square was beautiful and well taken care of. The next day we finished the rest of our walking tour starting at the heart of the old city: Dutch Square. The buildings in this area are painted red. Supposedly, this was done by the frugal Brits. The walls were originally painted white by the Dutch, but because the stone underneath was red, it would leak through the paint causing them to have to repaint frequently. Painting them red solved the problem. We walked up St. Paul’s hill for a spectacular view of Melaka. The tour eventually took us back to the Little India/Bukit Cina area. We headed to Selvam Restaurant where we were treated to a feast of epic proportions! We went back the next day to try their tandoori chicken and naan: we were not disappointed. St. Paul’s Church with St. Francis Xavier in front. Our veritable feast at Selvam Restaurant. Melaka is definitely a must-see. History, architecture, food: the perfect backpacker town with an authentic Malay feel to it. Next up, we set our sights on island life as we head to Pulau Tioman, selected by Time Magazine as one of the world’s most beautiful islands! Hello. I’m writing a paper involving the shophouses in Melaka. Are these beautiful photographs taken by you? I would like to include them with reference if that’s alright. Please feel free to use them. I am also going to email you a few more photos that we have that aren’t on the site.